If you’re just entering the exciting world of accounting, then we have some great tips for you! 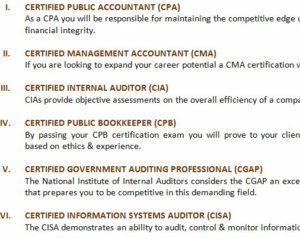 The free The 25 Best Certifications for Accounting Professionals is a comprehensive list of all the certifications that accountant employers want to see. You can use this list to get the certifications that matter and impress employers from a single glance of your resume. When you download the free template file, you will receive a list of certifications and a short description of each that tells you about the certification. Using this template you can go above and beyond on your resume and build a lasting career as an accountant. To download the free template file to your computer, follow the link at the bottom of this page. Next, start at the top of the page and take a look at all the options for certifications. Any of these will help you land the accounting job of your dreams but be sure to read what each one says. Some of the options are radically different than the others and most are specialized so you need to go through and make sure the certificate you want aligns well with what you’re doing. Let’s use and example so you exactly what to expect. Let’s say that you want to be an accountant and work for a highly respected government agency. The “CERTIFIED INTERNAL AUDITOR (CIA)” certification is a great tool for people looking for much-needed positions that focus inward to the employees of a company, business, or government agency. If you want to print the free The 25 Best Certifications for Accounting Professionals, you can do so by clicking the “File” button above and “Print” from the list of options below. You can use this template to take your accounting career to the next level!